Nellie arrived in Hong Kong with the monsoon. I landed in the midst of typhoon warnings and the undercurrents of civil turbulence. Pro-democracy demonstrations — the Umbrella Revolution — erupted one week after I left. Nellie had no idea that Elizabeth Bisland was racing around the world in the opposite direction. Nellie’s optimism at arriving in Hong Kong two days ahead of schedule quickly sunk to despair. She was only 39 days into her journey, and already in China. She headed straight to the Oriental and Occidental Steamship Company to book the first sailing to Japan, only to discover that someone was ahead of her. 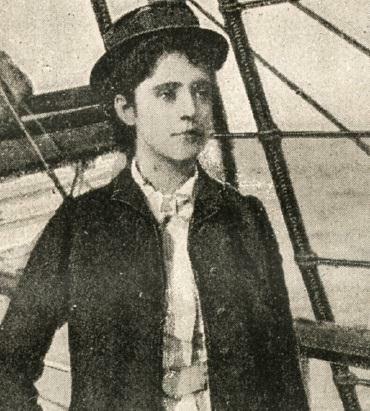 Elizabeth Bisland, a journalist and author sent by a competing publication, set out from New York the day Nellie left, circling the world in the opposite direction. Elizabeth had left Hong Kong three days earlier. An astonished Nellie kept her composure when the O&O Steamship officials told her the devastating news. Even worse, she would be stuck in Hong Kong Japan for five days awaiting her passage to Japan. When they told her that the race was over and she’d lost, Nellie replied: “I am not racing with anyone. I promised to do the trip in 75 days and I will do it.” She did it in 72; Elizabeth Bisland finished in 76 days. The rest is history. 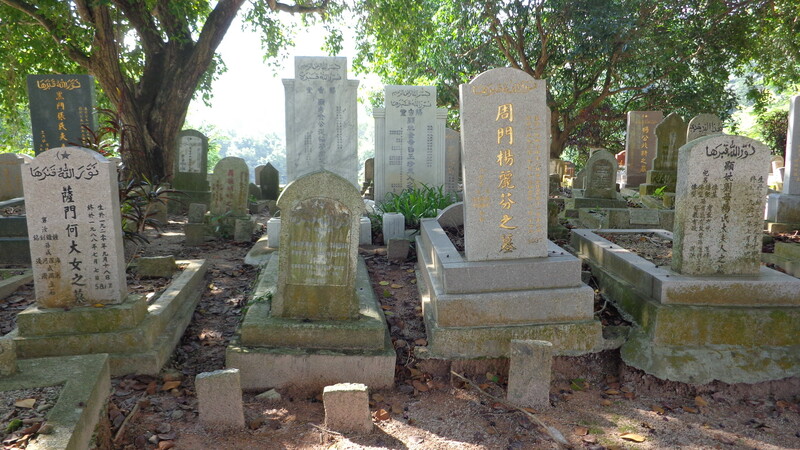 The Hong Kong that Nellie and Elizabeth experienced now exists only in photos, memories and a smattering of sites that have survived massive urbanisation. My goal was to locate them during my own race to beat the fury of approaching Typhoon Kalmaegi, due to sweep past the city at speeds of 125 km (77 miles) per hour. 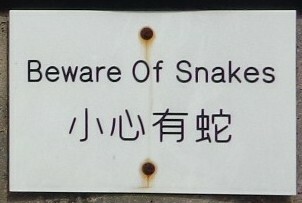 Warnings from the Hong Kong Observatory escalated. 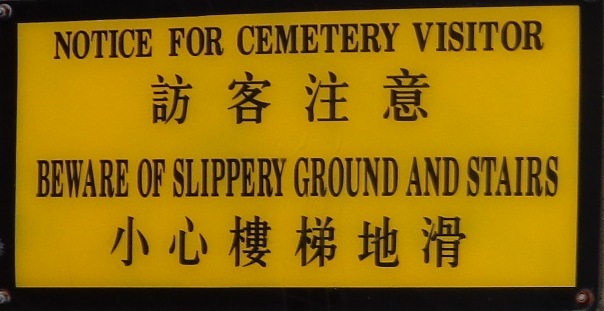 Something to ponder as I left Happy Valley for Hong Kong’s Causeway Bay waterfront. 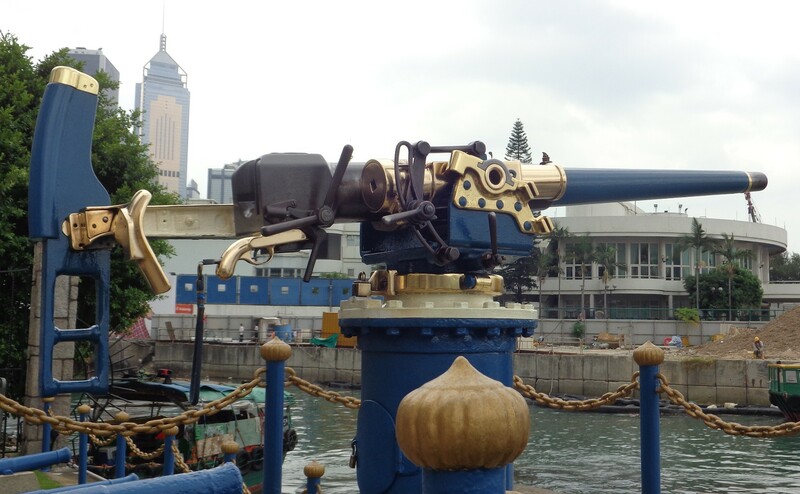 I got to the Noonday Gun there just in time for the daily blast. Made famous in Noel Coward’s Mad Dogs and Englishmen, the tradition began in 1864 when Jardine’s, the company who owns it, was required to fire a one-shot salute every day at noon for perpetuity as punishment. The company kept to the deal and now collects money for charity from those who wish to fire the Noonday Gun. Nellie would’ve experienced a bigger blast. Jardine’s lowered the power…and the decibels… in 1961 at the request of neighbouring waterfront establishments. 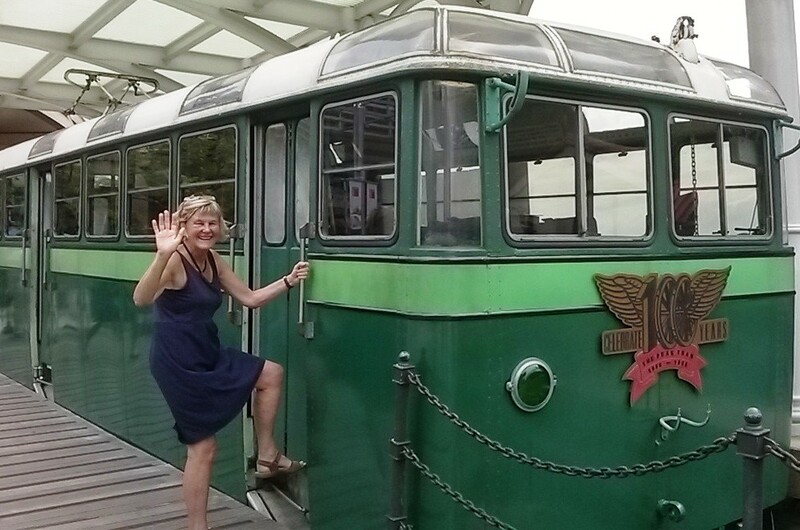 From sea level at Causeway Bay, I headed for the highest point in Hong Kong — Victoria Peak via the historic Peak Tram to Victoria Gap. 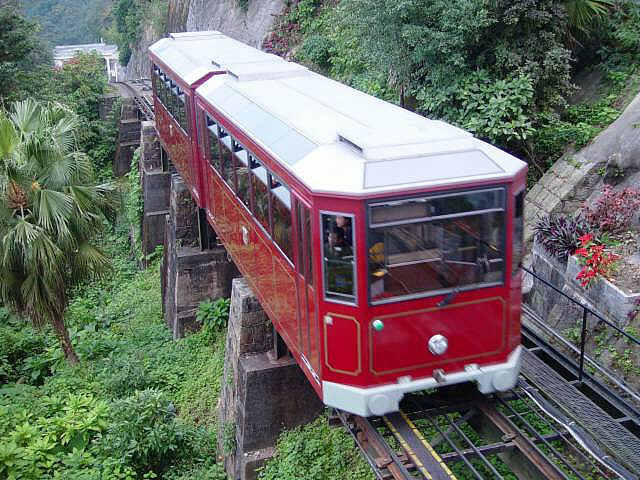 Asia’s first funicular and the world’s steepest, the Peak Tram is a feat of modern engineering that Nellie rode a year after it opened in 1888. The steam tram extending 1,350 metres to Victoria Gap cost Nellie 30 cents up and 15 cents down. Today it’s electric and costs $5 US round-trip. The tram carried as many as 150,000 passengers its first year. In 2013, its 125th year, the tram transported 4 million passengers. Seats have always faced uphill to prevent passengers from falling forward. Intermediate tram stops are named after former British governors/administrators — Kennedy, MacDonnell, May and Barker. If she stepped off the tram today, Nellie would be aghast to find Peak Tower, a colossal architectural icon devoted to consumption — home to the usual ghastly global suspects — Burger King, Crocs, Sunglass Hut, Adidas, Swatch, Swarovski and Travelex and more. Fleeing commercialism, I located the Hong Kong Tourism Board based on the Peak Piazza in a former tram. There I met Sanford Lee and Windy Chiu who made my mission their own — to track down the ‘umbrella seat’ that Nellie describes in her book Around the World in 72 Days. 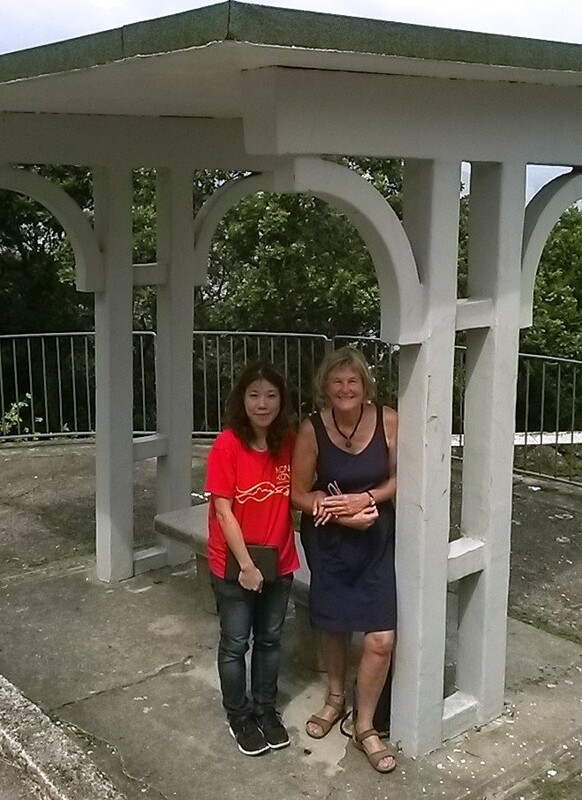 Windy Chiu and I at the Umbrella Seat where sedan chair carriers rested before reaching the top. Once I convinced them I was not in search of an umbrella (despite the approaching typhoon) nor a chair, Windy and I set off on an uphill search. Fifteen minutes later the elusive Umbrella Seat was before us. Not content with our original discovery, we climbed further up in the pre-storm heat to the Victoria Peak summit. Rain was falling in sheets by the time we returned to the tourist office tram. The typhoon signal jumped from 1 (standby) to 3 (strong winds). Taking the Peak Tram down, I arrived back at my hotel in Wan Chai to discover that typhoon signal 8 (gale and storm force winds) was in effect and all government agencies were now shut.